It's no surprise that the amount of internet data being created is skyrocketing, but what's important to focus on is how much of that data is"structured," meaning it's highly organized and can be easily classified or picked up by a search algorithm. According to Mary Meeker's annual tech trends report, roughly 10% of data is now structured. 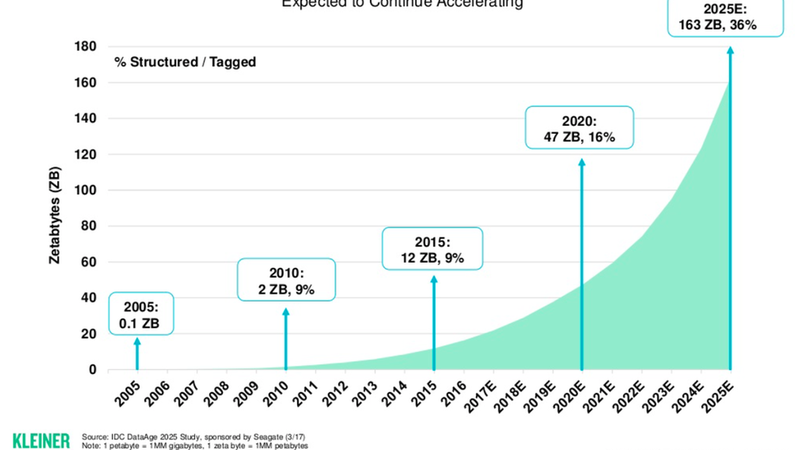 That's expected to reach 16% by 2020, even as the amount of data nearly quadruples. What's the difference? Email is widely considered unstructured data, while anything that is tagged or can be easily scanned through machine-learning, like a spreadsheet, is typically considered structured data. Why it matters: Structured data helps new internet-based companies grow -- including ones that provide goods and services in niche areas, like healthcare, connected homes, driverless cars, etc. It also helps older companies better leverage existing data. As data structuring becomes more sophisticated through advances in machine learning and artificial intelligence, it creates more opportunities for data-driven companies to make a bigger economic impact.